Destruction of Syria’s cultural heritage as the civil war unfolds has made major news around the world. World heritage sites that epitomize Syria, such as Aleppo and Krak des Chevaliers, have become battlegrounds, and many ruins have been looted and many museums have been plundered. The illegal export of cultural properties from Syria is an international concern. In light of this situation, UNESCO began efforts to safeguard Syria’s cultural heritage. 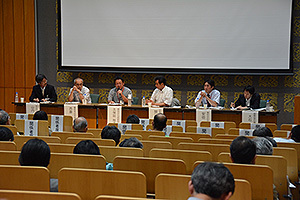 On June 23, the National Research Institute for Cultural Properties, Tokyo hosted a symposium on Safeguarding Syria’s Cultural Heritage. At the symposium, presenters reported on the expert meeting, “Rallying the International Community to Safeguard Syria’s Cultural Heritage” that UNESCO had convened from May 26 to 28. In addition, presenters reported on various activities both at home and abroad to safeguard Syria’s cultural heritage.